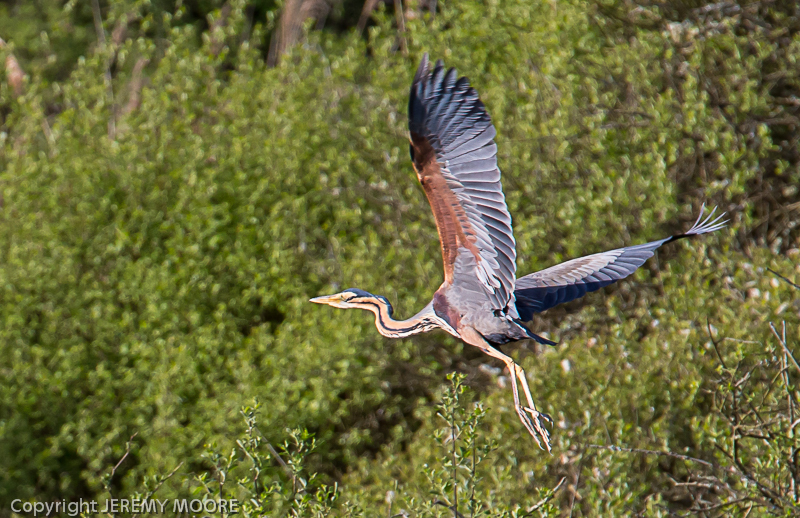 ← What a difference an hour makes…..
Purple heron : what an amazing creature! It goes on and on in this vein. I find it terribly depressing. The graphic designer could thus, for example, adapt a poor quality landscape image by adding a sky downloaded from a software package. No photographic skills required whatsoever! Likewise the amateur (or professional) landscape photographer wanting short-cuts to dramatic photographs. It has until recently been difficult to incorporate stunning skies into landscape images without stunning skies being present in reality. Doing so in the days of colour film would have involved a very high level of printing skills indeed and it is probably fairly safe to say that it had rarely been done successfully. In the brave new world of digital photography much of the work involved has been already been done by the software designer. But this kind of approach does more than make life easier for those wanting short cuts to great landscape images. It devalues photography in its most basic sense. By its very nature a photograph has documentary qualities. I don’t mean to confuse “landscape photography” with “documentary photography” here. But a photograph – any photograph – is an interpretation of a slice of reality. It is rooted in what the photographer saw through his/her viewfinder. So a landscape photograph automatically has documentary values. The very best have both aesthetic and documentary qualities in shed loads. If the photographer has added a spectacular sky – even one of their own – that link between reality and image has been lost. Many photographers argue that all photographs are “fake” to some extent and that therefore anything goes. In my opinion this just does not hold water. I agree that the photographer makes selections and interpretations at all stages of the process. They might use film or digital, a jpeg straight out of the camera or process a RAW file to their own satisfaction. They might use a 10stop ND filter on their DSLR, a smartphone or a pinhole camera, colour or black-and-white. By making these choices the photographer interprets their surroundings in different ways. But there is a quantum leap between that and getting a sky from elsewhere – their own library or a software program – to combine with their own image to produce a result. If it were possible (and necessary) the photographer would physically move a minor irritant (rubbish, for example) from the foreground of a landscape image before pressing the shutter. But if not I don’t really see a problem in cloning it out at the processing stage. I’m not that much of a purist. But it is at this point we enter a very grey area indeed. Where does one draw the line between “processing” and “manipulation” – the acceptable and the unacceptable? Personally I’m happy to clone out anything which on another day might not have been there: a walker in a red cagoule, or white van in the distance, for example. Others draw the line elsewhere. But there is a line. It may well be that advertising photography is artificial through and through, and maybe we should expect that. If there was a line of telegraph poles running through a landscape, though, I badly need and want to know about it. Every picture tells a story and a manipulated one can tell quite a different story. It could be the difference between a real wilderness and an inhabited landscape in this example. For more thoughts on this subject see this post. On the other hand I have no philosophical problem with improving my images at the processing stage where necessary. The more I use Lightroom the more I learn what it is capable of. I was recently introduced to the adjustment brush by my correspondent David Clegg and how useful is that? How could I have managed without it, more like! During the latter stages of my Bird/land project I was able to use the adjustment brush (rather than the radial filter) to select the bird before making minor changes to its exposure or contrast, for example. So much more effective! See the purple heron image above. More on Bird/land very shortly, by the way…….. This entry was posted in Uncategorized and tagged adjustment, brush, documentary, landscape photography;, manipulation, processing, qualities, replacement, sky, software. Bookmark the permalink. 6 Responses to Every picture tells a story. Be interested in your opinion on the landscape pics on the Elan valley blogsite, some weird and wonderful colours. I can’t find this blog but if you send me a link to it I’ll have a look. Go to facebook elan valley timeline. Not all pics are like this but the one Elfyn Pugh posted is. Yes, there are some pretty ghastly landscapes on there. Its called High Dynamic Range, which involves combining two image files with different levels of exposure into one image. When done with subtlety, this can enable you to get a good image from an otherwise impossible scene. I talk about this in my reply to David Clegg’s comment. However, if done badly, you get a mess like those. For about five minutes it was fashionable to do this deliberately but I’m glad to say it has almost died a death now. Almost. Hi Jerry, can’t say I’ve received the junk email but it wouldn’t have held any interest if I had. Not that I take many landscape images but my thoughts on them are pretty much the same as yours above. I’d rather work with my own image than something created from elsewhere. I’m only guessing but unless you’re a processing whizzkid then I bet the results from these sky apps would look pretty false anyway. Then again, there are quite a few whizzkids out there so I can understand your concern! The latest version of Lightroom now has “face recognition”, I’ve no idea how that one works and have no intention of finding out! David, many thanks for your thoughts. I’ve always thought that the most appropriate use for a grad filter – actual or digital – is to compensate for the inability of originally colour film, and more recently digital sensors, to cope with the brightest highlights in the sky and still obtain detail in the land itself. So I don’t really think it would come under the heading of manipulation in my scheme of things; more of a rescue remedy. I don’t find the grad in Lightroom very easy to use actually so I still usually use an actual piece of plastic in front of the lens. As for face recognition I doubt I shall ever use it either. But I’ve had a quick play with the HDR function and it has certainly rescued one image. Some might say that this came under manipulation but again I would argue that it is a means of obtaining a well-exposed image from a difficult, high-contrast scene. Maybe we are close to the point where it is necessary to label an unmanipulated image as such. It would be a terribly sad day. Fortunately there are still those who uphold the traditional way of doing things. Charlie Waite for example. Did you read about the controversy a few years ago when the winner of a number of categories (and overall winner) in his Landscape Photographer of the Year competition were eventually revealed as fakes and disqualified?